Xugana Island Lodge is one of the few permanent water lodges in the Okavango Delta. It is ideal for a Romantic getaway or Botswana honeymoon safari. 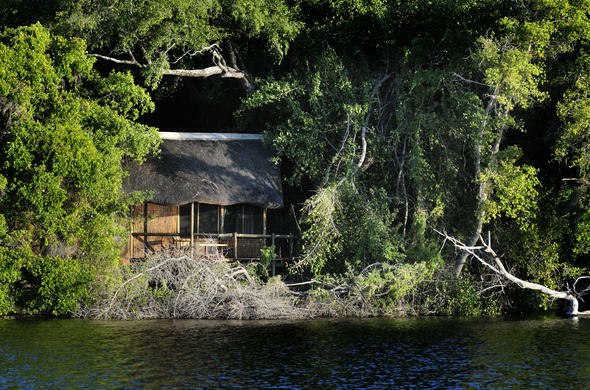 Xugana Island Lodge is situated on a private concession in the pristine Okavango Delta. Located under an Ebony and African Mangosteen tree canopy, Xugana Island Lodge boasts sweeping views over a beautiful large lagoon right in the heart of the Okavango. This exclusive Botswana game lodge offers comfortable accommodation for just 16 guests in elegant chalets. The reed and thatch chalets are situated on raised teak platforms and overlook the Xugana Lagoon. Each chalet features a private viewing deck and en-suite facilities. Fish for Tiger Fish and Bream from Xugana Island Lodge or explore the Okavango Delta's waterways by powerboat. Alternatively, glide through the water on a mokoro (canoe) while enjoying some birding. Explore some of the surrounding islands on a guided nature walk and spot some of the larger African wildlife species such as Buffalo and Lion. The Okavango Delta is home to a great diversity of birds and animals. There is a choice of activities for you to choose from whilst staying at Xugana. These range from boat and mokoro excursions, walks on the surrounding islands as well as fishing trips.